Good leadership team work is a key to business success. It requires a courageous renewal and continuous development of strategic thinking and cooperation. With Rokmind’s Leadership Team Success Index™ (LTSI™), these areas are sharpened to the top! 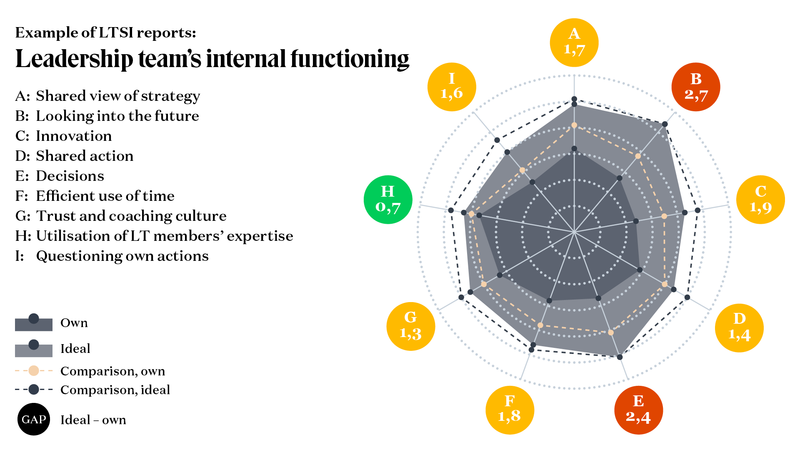 Leadership Team Success Index™ (LTSI™) is a powerful and analytical digital tool for mapping the current and ideal state of the leadership team work. It is based on 900 respondents’ benchmark information on the success factors of leadership team work. The original developer of the research based eTool is PhD Helena Åhman. LTSI™ generates significant data of the strategic thinking of the leadership team and the ability to reflect, innovate and cooperate. With the experience of LTSI™ evaluations conducted, we can promise that this eTool has a clear impact on the effectiveness of the leadership team work as it creates accurate understanding of Leadership Teams’ development needs. The evaluation process starts with online data collection, which gives an objective view of the current and ideal state of the leadership team. Based on results and analysis, we share and discuss through our development suggestions in order to maximize the results of the evaluation. The goal is to support leadership teams’ ability to implement strategy and to increase ability and focus to lead business operations. Enabling concrete change, not just talk. Seuraava artikkeli Menestysindeksi™ hioo johtoryhmätyöskentelyn huippuunsa Edellinen artikkeli Does Executive Team Development pay off?